The public can find out how Pima County plans to connect The Loop along Pantano Wash between Broadway and Kenyon Drive at an open house on Thursday, March 13. The project’s new segment will connect to a half-mile segment of The Loop north of Broadway and a three-mile segment south of Kenyon Drive that connects to Sellarole Street to Harrison Road to Irvington Road and the Fantasy Island mountain bike trails. The County recently applied for $300,000 from Arizona’s Military Installation Fund to buy a strip of state land along Fantasy Island mountain bike trails. However, the County claimed that the purchase was for the benefit of Davis Monthan Air Force Base. The Military Installation Fund was developed to use taxpayer dollars in defense of military bases from encroachment from their host communities. It was intended that communities would purchase land that might be used in the future in such a way as to hinder the installations’ mission. The swath of land in question, runs along the perimeter of the Davis Monthan Air Force Base, its current use is a hiking and bike park. As a result, the acquisition by Pima County relying on the claim that the base was at risk of encroachment, has come under scrutiny. In other words, the State is giving Pima County money to purchase land from it to preserve a shooting range that does not seem to be hindered in any way by the people who are currently using it all day. The open house will be from 6:00 to 7:30 p.m. at the City of Tucson Ward 2 Office, 7575 E. Speedway. There will be a brief presentation at 6:15 p.m. Project displays will be available for viewing. Pima County has been developing The Loop around metro Tucson with links to Marana, Oro Valley, and South Tucson for residents and visitors on foot, bikes, skates, and horses. When completed, The Loop will total 131 miles and connect the Rillito, Santa Cruz, and Pantano River Parks with the Julian Wash and Harrison Greenways. 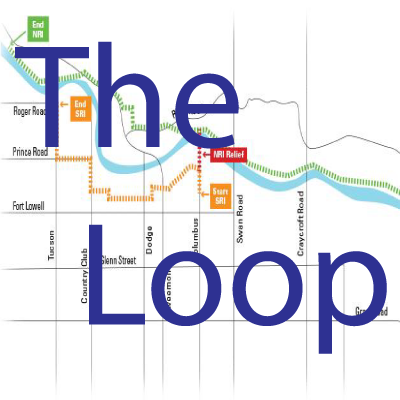 According to sources, the County has already spent over $50 million on The Loop over the years.